Curses aren’t real. We all know they aren’t real. But it’s difficult to be a sceptic when we find ourselves here again, is it not? The last three original UFC main events were cancelled, but if you are going to lose a dream fight, then you want an absolute stud like Max Holloway around. A quick recap for continuities’ sake. On April 1st, news broke that Tony Ferguson had tripped and tore a knee ligament, putting him out of his scheduled lightweight title fight on April 7th. This is the fourth time “El Cucuy” and Khabib Nurmagomedov had a date to throw down, and the fourth time it had been cancelled. Naturally, the timing of the announcement – April Fool’s Day – led to an outpouring of disbelief. Tony Ferguson did not trip and injure himself six days before his fourth scheduled fight with Khabib. Nope, not today. I’ll wake up tomorrow morning and everything will be fine. Yep,the rising sun of April 2nd will bring with it resolution. April 2nd came, and its real ladies and gents. A paltry expression of bereavement on this writer’s part would simply not convey the Shakespearean level of comic tragedy we see before us. I’ll instead direct your attention to this gif from Breaking Bad. It would be easy to spend a good 1000 words talking about this; the best fight we may never get to see. But, the show must go on, and to be fair to everyone involved, it is very much doing that. In a shocker of a twist, the reigning featherweight champ, Max “Blessed” Holloway, is stepping in for a crack at the 155 strap. Holloway has already assured himself a first ballot entry into the gangster hall of fame, but there’s a lot more angles to this one than the size of the Hawaiian’s balls. “Blessed” currently holds the featherweight championship, after two virtuoso performances against the consensus 145 numero uno, Jose Aldo, last year. This pair of W’s extended the 26-year-old’s (26!) unbeaten streak to a sturdy 12, fifth in UFC history behind Jon Jones’, GSP’s and Mighty Mouse’s 13, and Anderson Silva’s 16. Holloway’s run consists of 7 KO/TKO’s, 2 submissions and 3 unanimous decisions. As dominant a clearing out of a division as can be recalled in high level MMA. Now, Holloway has a chance to make all kinds of history. But in all honesty, the units of probability compiling against a “Blessed” victory are too numerous to ignore. Six days’ notice? Check. Recently injured? Check. Different weight division? Check. The featherweight champion must overcome circumstance before he can even overcome his actual opponent. And what an opponent that is. Khabib Nurmagomedov is arguably the most dominant force in MMA, and that’s not just regarding his perfect 25-0 record, this is reflected in the contents of his fights. Utilising a relentless chain wrestling attack, the Dagestani grappler has made a habit of putting people on their back and smashing – smashing! – them with ruthless ground and pound and accompanying top control. “The Eagle” doesn’t win fights, he takes them, and no one has yet figured out how to hold on. When people step into the cage with Khabib, they’re statistical likeliness to win the fight is disproportionate to their other bouts. Factor in the secondary conditions, and we see a mathematical quagmire for an otherwise capable fighter in Holloway. An all action attitude, but realistic mindset, are a big part of what has made the striker so popular with fans. He realises the mammoth task before him but is willing to take the risk. Had the roles been reversed, Khabib said he wouldn’t have taken the fight. A mature head on young shoulders should spell a prosperous future for the potential future champ champ, win or lose. However,even the most optimistic MMA fan would likely be surprised at anything other than another supreme victory for “the Eagle.” Should Holloway pull this off, we have a divine table set for the summer. Earlier, I spoke about Holloway’s spell of dominion at 145. The 12-win streak traces all the way back to 2013. Who beat Max that year? Why, Conor McGregor of course. Rack your brain, you’ll shake the name loose I’m sure. If you follow social media (you do, don’t lie) you’ll have seen the back and forth between “the Notorious One” and Holloway, since Max’s second defeat of Jose Aldo, a common opponent between the two. McGregor, being the Michael Jordan of capitalising on news to keep himself relevant, was quick to point out that Holloway was merely a rung on his ladder at one point in time. Don’t think Conor doesn’t see potential for a money fight down the line. Holloway himself seemed to be more than up for the fight; of course he is. 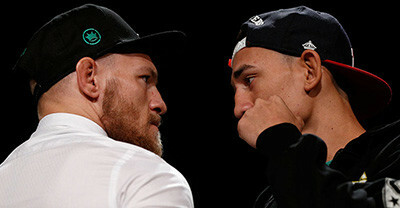 A flashpoint of opportunity for Max; with five years of winning, a title capture, and two defeats of Aldo under his belt, a chance to avenge his loss will be an intoxicating proposition. This goes further though. If Max beats the seemingly unbeatable this weekend, then he has arguably done everything the Irishman has done but better. A tear at featherweight, followed by a pair of thorough outworking’s of Jose Aldo – a man once considered unstoppable – then an immediate shot at the belt ten pounds up to become champ champ. Another interesting titbit from the Brian Butler interview: he specifically mentioned that Holloway wanted to do what “the other champion didn’t.” That being defend his belts. Plus, it would be the biggest payday of Holloway’s career. If Max Holloway pulls this off, we might get ourselves a better scenario than we thought was available to us. I’m sure some conspiracy theorists will tell you they smell a rat (look into it!) but serendipity such as this is not unheard off in sports. Max Holloway likes to say, “to be the best you gotta beat the best, and the best is Blessed”. It’s impossible to deny his conviction, and on April 7th we’ll find out if the “Blessed Era” can really reach that next level.